Colored zones and low walls identify class-specific eating areas at the friendship school in Waterford, Conn. When it comes to flooring choices, public school systems have been creatures of habit specifying products based on immediate cost and function. But, times are changing and so are the interior design needs of today’s K-12 education sector as aging buildings undergo makeovers nationwide. K-12 is in the midst of a remodeling boom, fueled by the rising number of students and older school buildings. Local and state governments have reportedly loosened their purse strings to fund capital improvement projects at elementary, middle and high schools. It isn’t that money is no object for school districts anymore. Rather, purchasing influencers — ranging from school boards to administrators to local community members — are spending more wisely. While performance, health and safety requirements remain important criteria, school districts are now looking beyond installed costs and factoring in the long-term maintenance expenses for flooring. It is, however, a work in progress. “The greatest challenge that remains are opposing budget constraints, where it is difficult to increase the capital budget in order to reduce the maintenance budget,” said Kieren Corcoran, marketing director, education and government at Patcraft. Mannington Commercial’s Teles is a high resiliency rubber floor featuring indentation resistance of 1,500 PSI, acoustic benefits, comfort underfoot and a self-migrating wax finish. 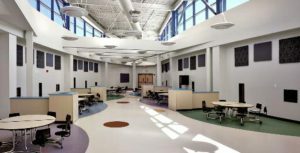 These life-cycle costing issues carry greater weight than ever for budget-conscious school districts nationwide, which is a major reason for increased interest in luxury vinyl tile (LVT) and carpet tile in the education space. This growth in low-maintenance soft and hard surfaces comes at the expense of vinyl com- position tile (VCT), a low-priced workhorse product requiring chemical applications that far exceed the original installation cost over time. Generally speaking, VCT often requires re-waxing due to major scuffing issues. By comparison, a product such as rubber flooring features a low-maintenance cleaning system and is known for “healing” itself when faced with punctures. “This means going to no-wax hard surface floors and better quality carpets,” noted Julie Tonning, district manager, Mannington Commercial. Marine Science Magnet High School worked with JCJ architecture to create variety and interest between spaces using contrasting carpet tile patterns throughout. 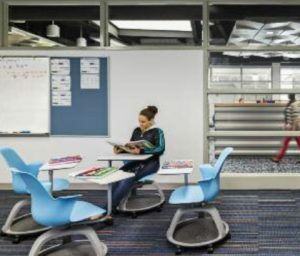 Although designers report that hard surfaces are being specified predominantly in classrooms and soft surfaces in spaces such as media centers and common areas, each district has different requirements. This in tandem with the rise of open-concept, multi-use spaces has led to the recurring design theme of coordinating soft and hard surfaces in similar looks. 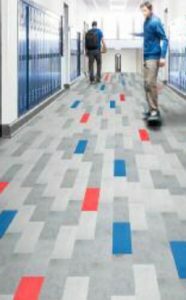 LVT and carpet tile are also coveted in the K-12 segment today for their color and design flexibility, enabling specifiers to move away from the mundane looks of the past. 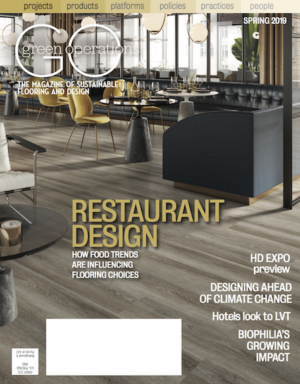 “There is a strong trend to move from VCT to LVT, as the LVT aesthetics continue to improve,” Patcraft’s Corcoran said. CannonDesign chose vinyl tiles that look like stone in Leslie Shankman School Corp.’s Hyde Park Day School’s circulation spaces. The striking realism of LVT and its strong resemblance to natural materials is a major draw for designers. CannonDesign’s Morales noted the great variety of stone and wood replicas — both texture and color — today as an example. “These are great for spaces with high-traffic areas where, aesthetically, you still want a natural look,” she said, “plus the greater slip resistance of an LVT.” For these very reasons, CannonDesign specified a vinyl wood plank in classrooms and a vinyl tile that resembles stone in all the circulation spaces at the Hyde Park Day School in Chicago. On the soft surface side, carpet tile is growing the fastest, in part, for its creative application options with an assortment of sizes, colors and textures. The product’s sustainability factors — easier to take up and recycle than broadloom — also has modular carpet gaining traction in education. 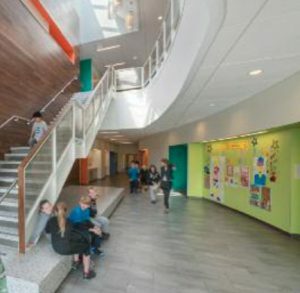 Whether specifying hard or soft surface, the biggest takeaway for designers in the K-12 segment might actually just be the importance of education and evolution. Looking ahead the A&D community needs to help school districts remain knowledgeable about flooring choices. Not all products are alike or applicable for every situation, but innovative solutions are blurring historical boundaries to meet the modern classroom’s needs.